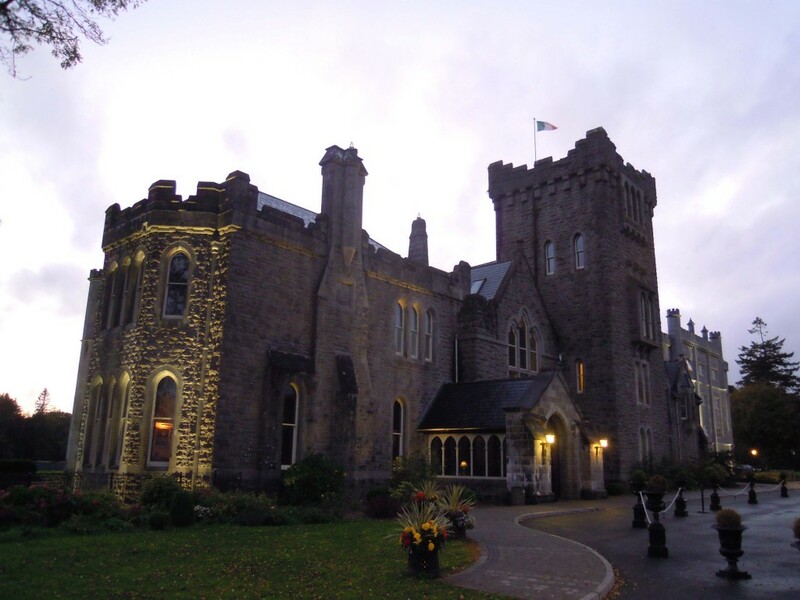 We’re just back from a brief break to mark our first wedding anniversary, spending two nights at Kilronan Castle, a restored neo-gothic style mansion, now in use as an hotel, on the shore of Lough Meelagh in North Roscommon in the heart of what was once the ancestral lands of the MacDermott Roe family. 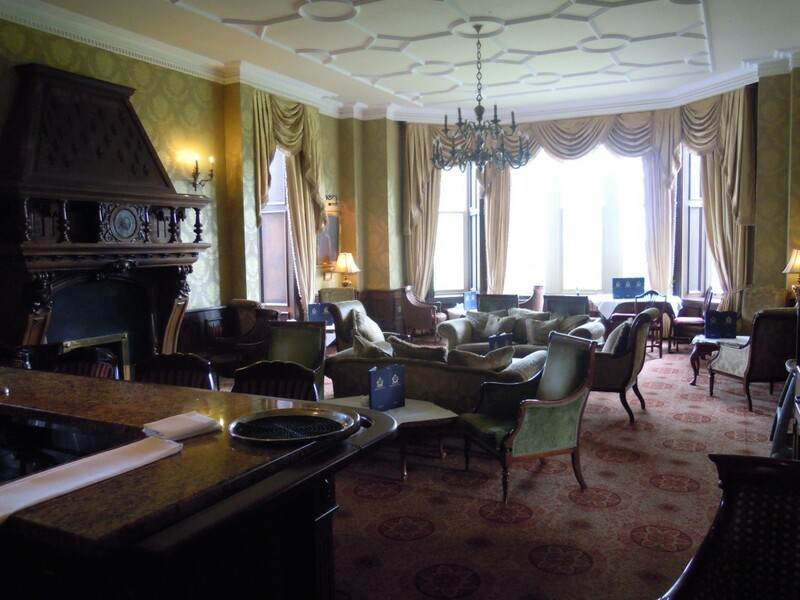 The scenery about Kilronan and the surrounding towns of Keadue, Ballyfarnon and Boyle is unrivalled, nestled among a proliferation of hills, lakes and forests, but not so long ago this hotel was a roofless ruinous shell. 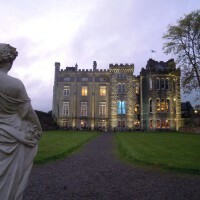 Formerly the residence of the Tenison (later King-Tenison) family, a house had existed here in the early 1800s and was replaced in the late nineteenth century with a neo-gothic mansion called Castle Tennison, which, by the late twentieth century had fallen into a serious state of disrepair. 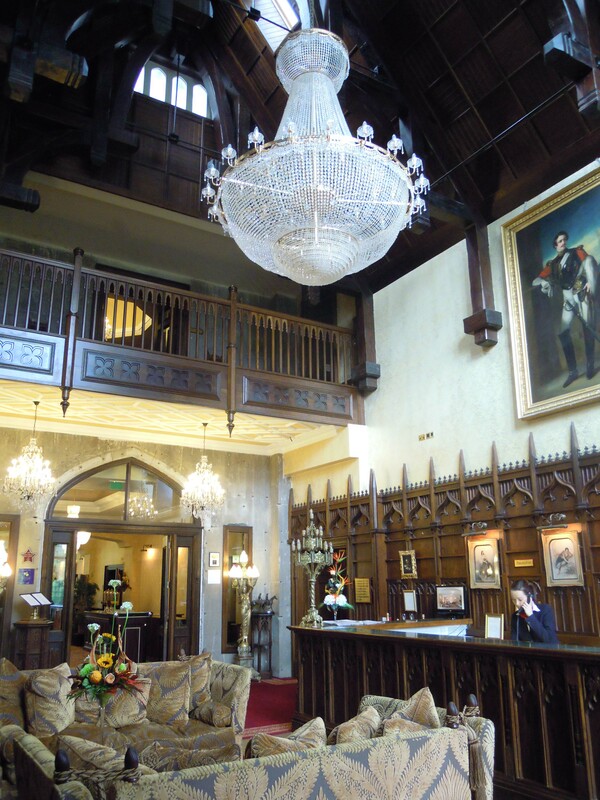 Few modern purpose-built hotels, with their clean lines and often clinical surroundings, can boast the ‘lived-in’ comfortable ‘easy-chair’ atmosphere of a restored or converted ‘big house’ or castle with its centuries-old history as a family home. 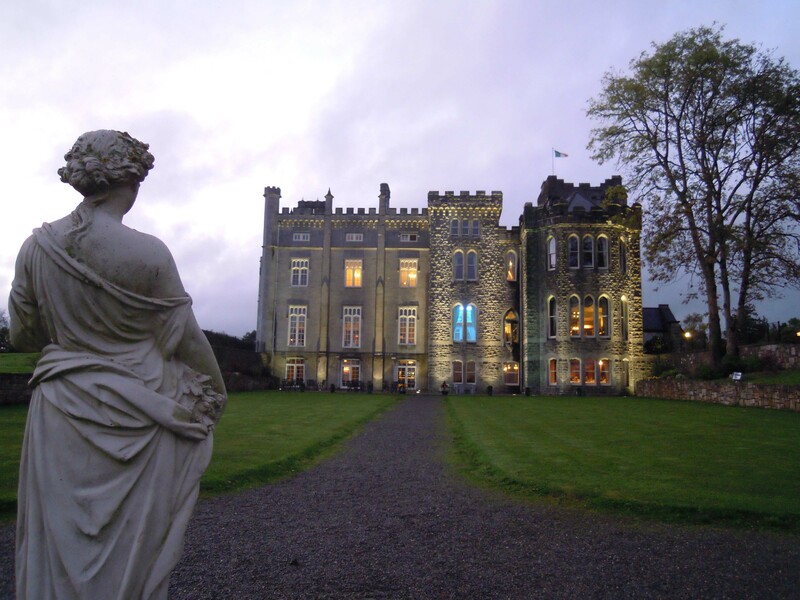 The owners who restored this castle did a wonderful job in achieving that atmosphere in the original structure. 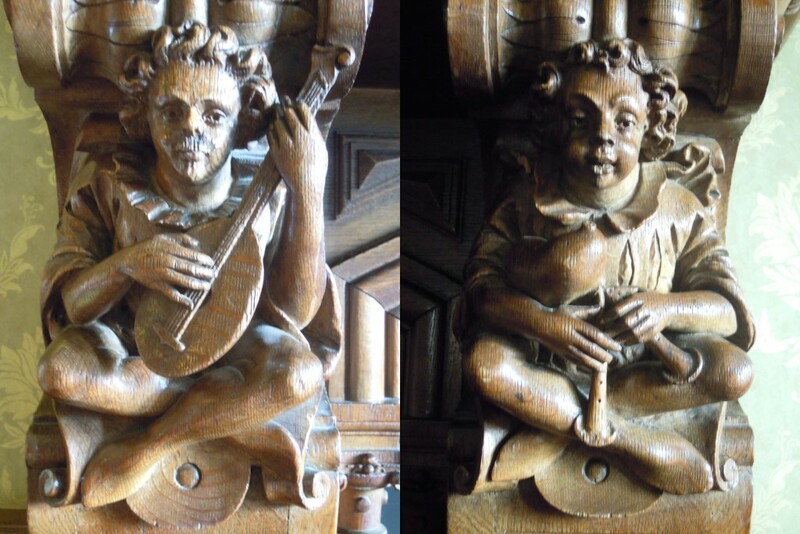 The attention to detail in the old building is remarkable, with finely carved timberwork and panelling throughout and no expense spared. Photographs about the hotel show the forlorn shell as it stood for years before it was brought back to life about 2006 and 2007. The former hall, now the reception area of the hotel, beautifully re-built and refurbished. 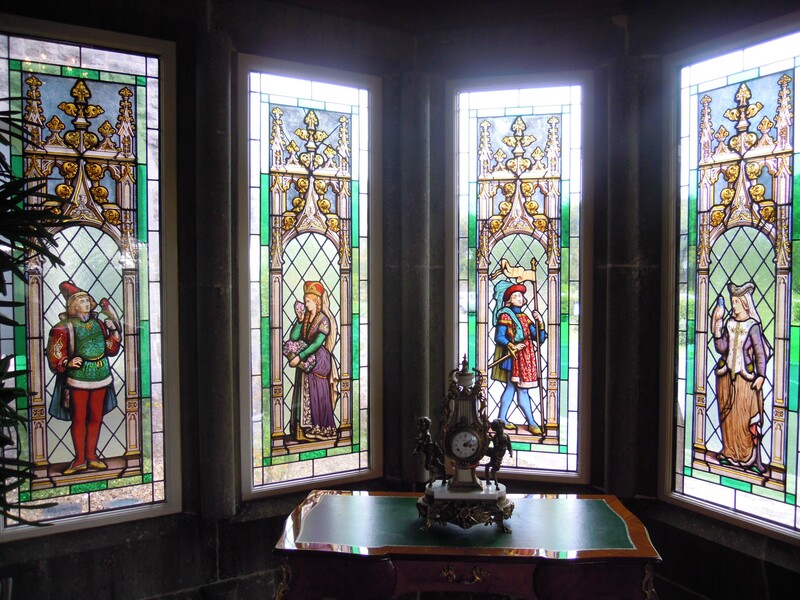 New stained glass windows inserted into the entrance porch. The porch as it originally stood sported a crenellated parapet that was altered to a pitched gable as part of the new early twenty-first century work. 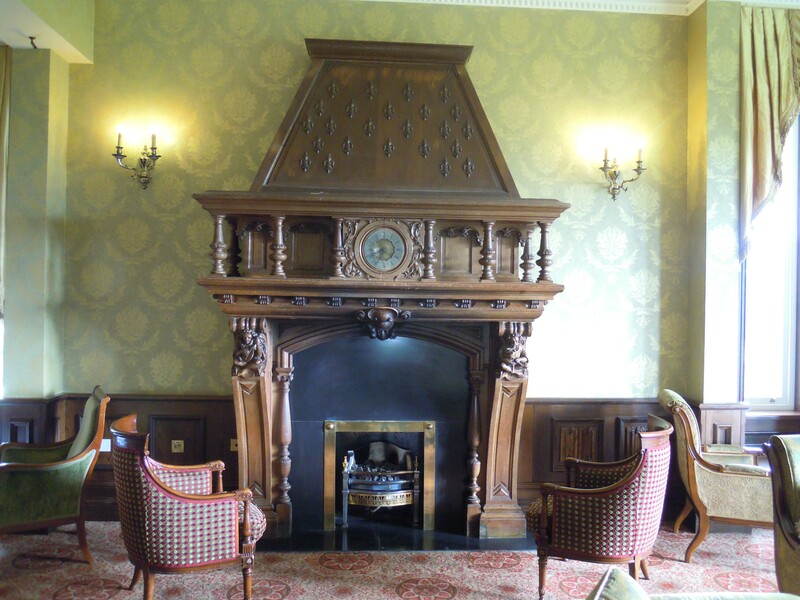 The drawing room, one of the most pleasant rooms in the hotel, with its newly inserted timber chimney surround and carved figures. 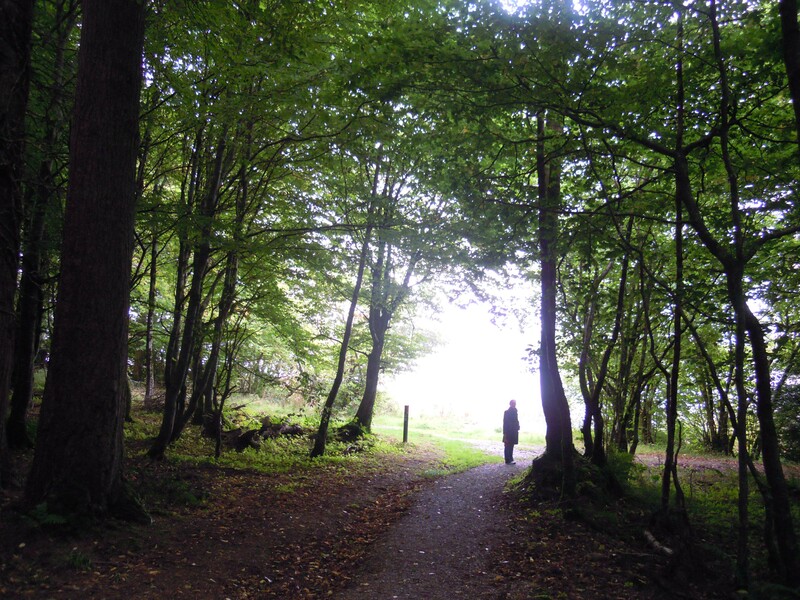 Overall, we had a wonderful time at Kilronan but in the interest of giving a balanced assessment, I should list a few minor grumbles. On reaching the estate, an unfortunate incomplete gateway of false stonework that belongs more to a Disney set than an Irish landed estate is followed by a bulky modern extension with ill-proportioned fenestration that doesn’t do justice to the original and whose interior sported awful mock medieval weaponry on its walls that may have been borrowed from the same film set. Despite these minor criticisms, we thoroughly enjoyed our stay. 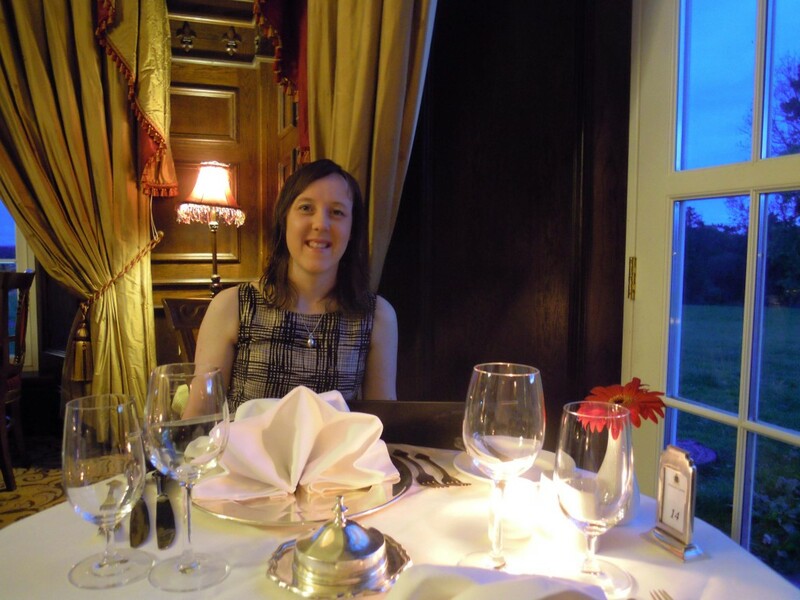 The service was friendly and helpful, the food good and the setting, amid a deeply wooded demesne on the verge of the lake, was stunning. We stayed in the old building so I couldn’t comment on the new rooms but our room was comfortable with beautiful views over parkland and mist and tree-covered hills in the distance. Sitting in the drawing room on our first night we spotted a brochure advertising the attractions of nearby Carrick-on-Shannon in County Leitrim, this year celebrating four hundred years since the granting of its charter by King James I. I could see Alison’s delight turning to concern when I noticed an exhibition on heraldry advertised in the St. George Heritage and Visitor Centre in the town. Concern turned to delight when it dawned on Alison that this could mean at least an hour husband-free shopping about the town while I absorbed all on show. 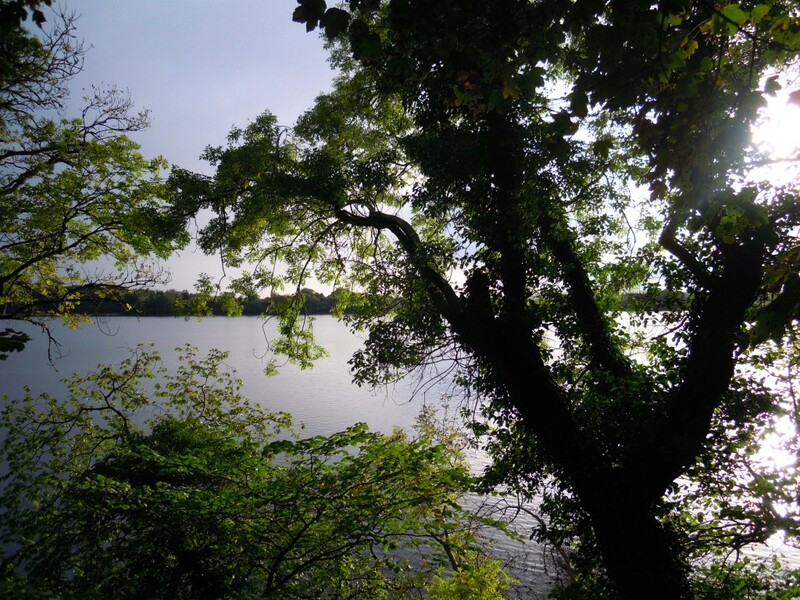 Next morning, after speeding Alison through her breakfast, we drove to Carrick-on-Shannon, by way of the beautifully maintained small town of Keadue, not far from where the celebrated blind Irish harper and composer Turlough O Carolan spent his final days. 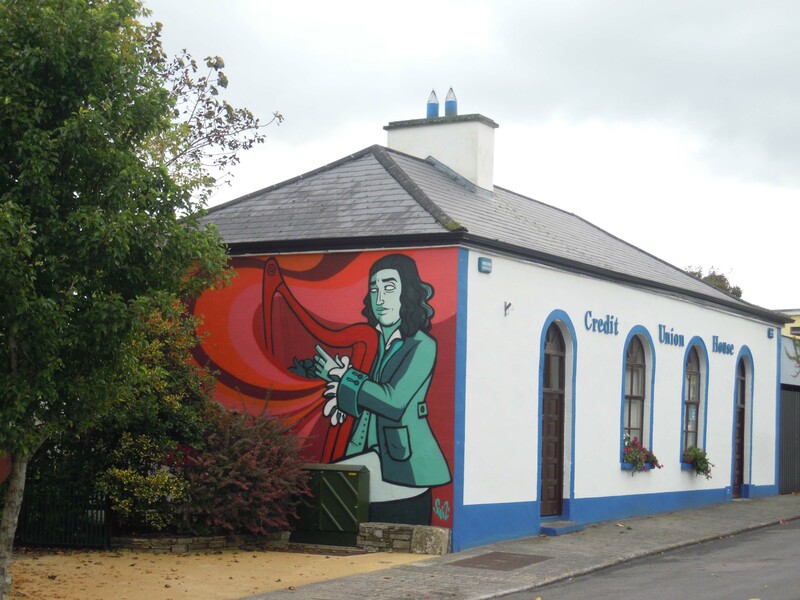 A mural of Turlough O Carolan on the wall of the Credit Union building in Keadue, commemorating the blind composer’s connection with the town. 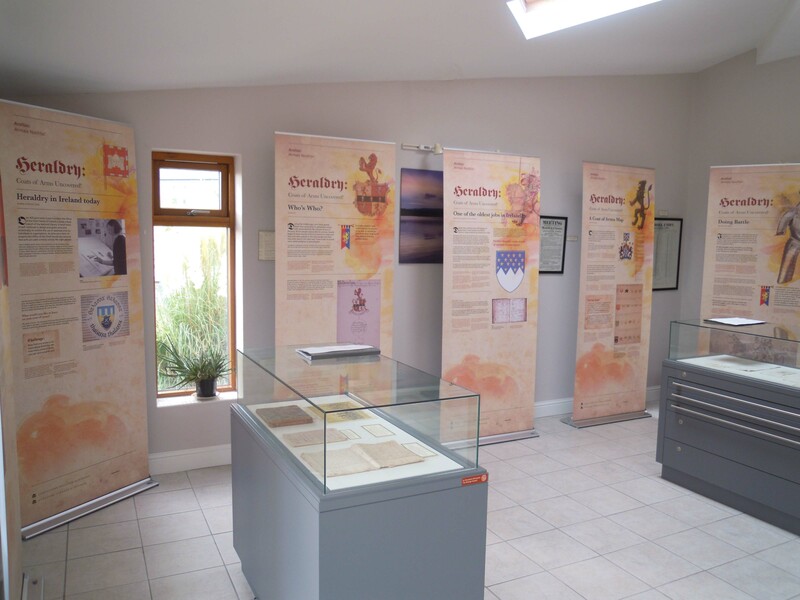 Introductory banners on the subject of heraldry at St. George’s Heritage and Visitor Centre. 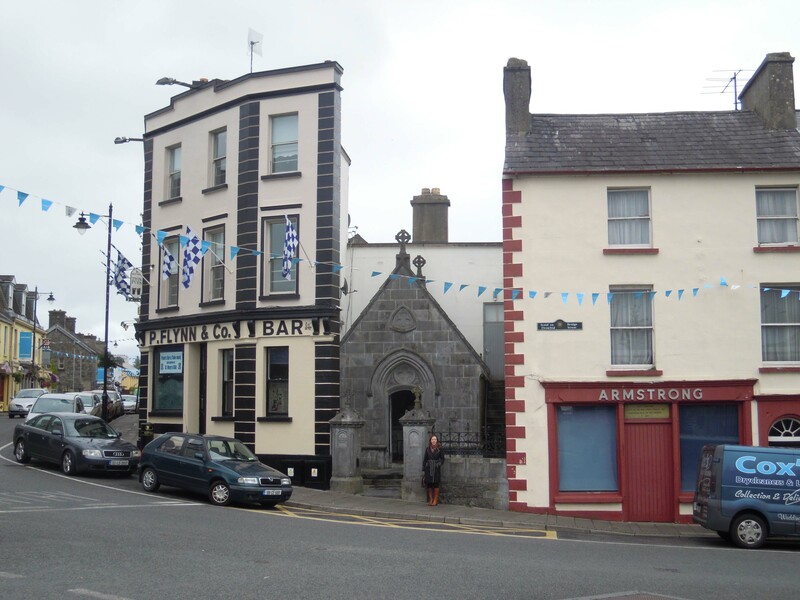 That being said, I also enjoyed Carrick-on-Shannon and in particular the little gem that is the Costello Chapel, book-ended between taller buildings in the middle of the town. The Costello Chapel on Bridge Street, Carrick-on-Shannon, dedicated in 1879. 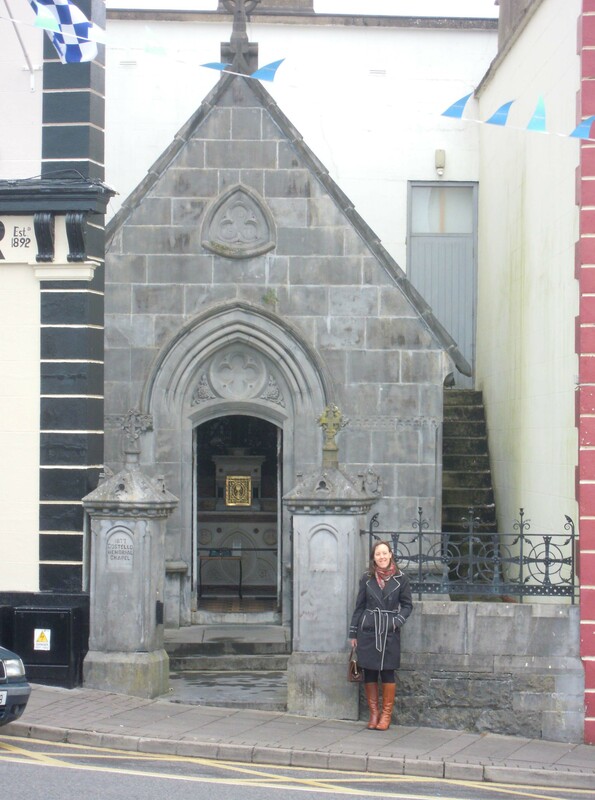 At approximately 4.8m long and 3.6m wide, the chapel is given as the smallest Roman Catholic Chapel in Ireland and reputed to be the second smallest in the world. 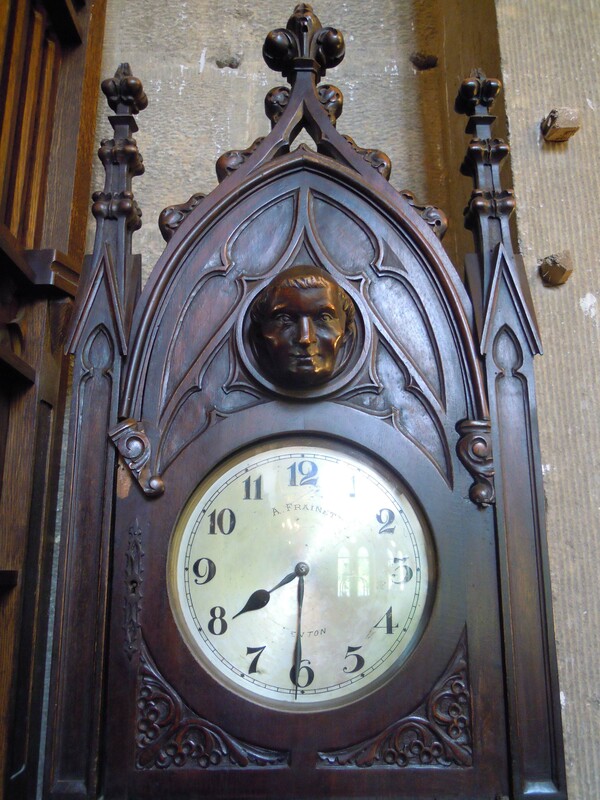 Having lost his beloved wife in 1877, a disconsolate Edward Costello had this small chapel erected in the town, wherein, to the left of the tabernacle, her coffin was placed beneath a solid layer of glass at the chapel’s dedication in 1879. 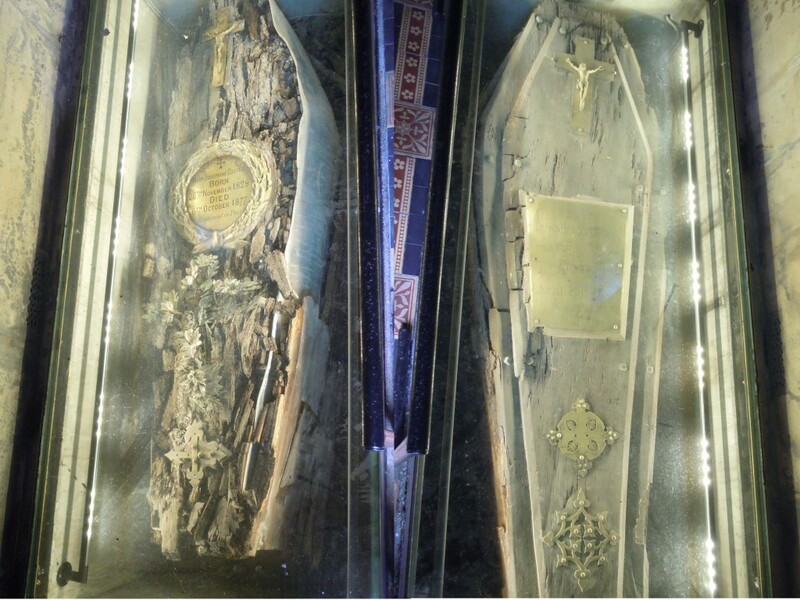 On the right hand side of the tabernacle, a space was left empty to receive his own coffin when his time came, but in the meantime, up to his death in 1891, mass was celebrated in the chapel on the first Friday of every month for the happy repose of his wife’s soul. The chalice commissioned by Edward Costello for the solemn mass at the dedication of the chapel was used at each First Friday mass and is now on display at the St. George’s Heritage and Visitor Centre. 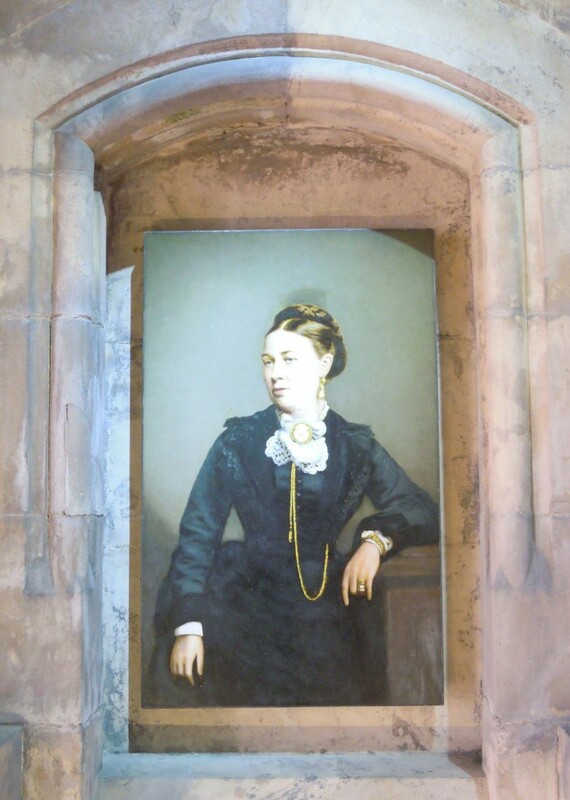 A portrait, placed in the wall of the chapel, of Mary Josephine Costello, who died at the age of forty-seven years in October 1877, in whose memory her grieving husband Edward had the chapel erected. The coffins of Mary Josephine Costello (left) and her husband Edward (right), each set beneath a layer of glass in the floor of the chapel before the tabernacle. 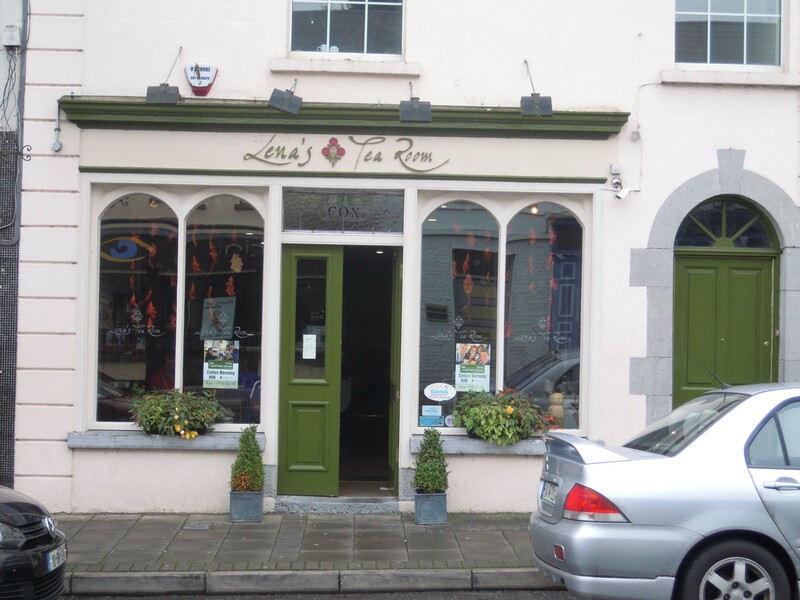 My favourable impression of the town may also have been coloured by the extra large slice of coffee cake I consumed in ‘Lena’s Tea Room.’ Despite promising Alison that I wouldn’t eat it all, it somehow disappeared and proved a tasty appetiser to my dinner back at Kilronan later. 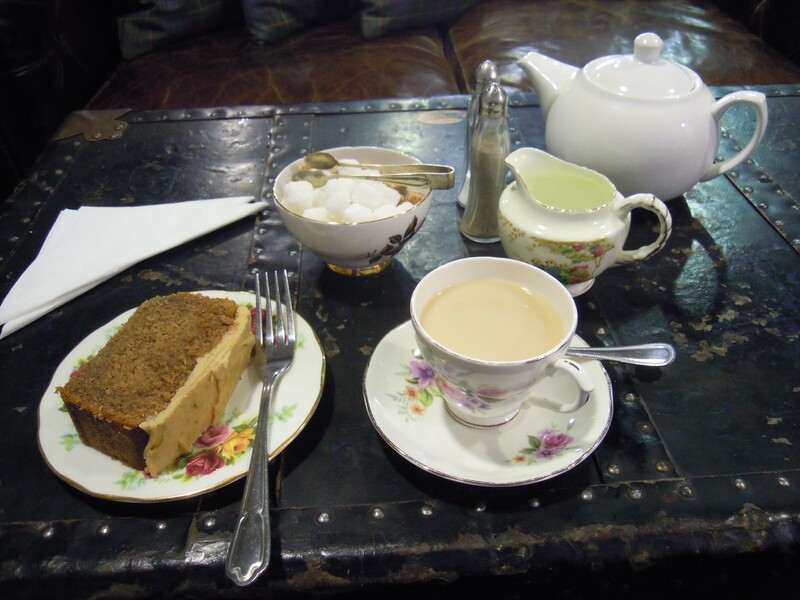 The disappearing slice of coffee cake served at ‘Lena’s Tea Room’ in Carrick-on-Shannon. Before we left I couldn’t fail to visit the nearby ruins of the church at Kilronan, wherein rest the mortal remains of Turlough O Carolan, feted by some romantically as ‘the last of the Irish bards.’ Born in 1670 in County Meath, he died in 1738 and lies in the ruins of the MacDermott Roe family side chapel but the remnants upon his headstone of candles long since quenched and the annual O Carolan Harp Festival and Summer School in the nearby town of Keadue testify to his continued presence in the minds of the people. 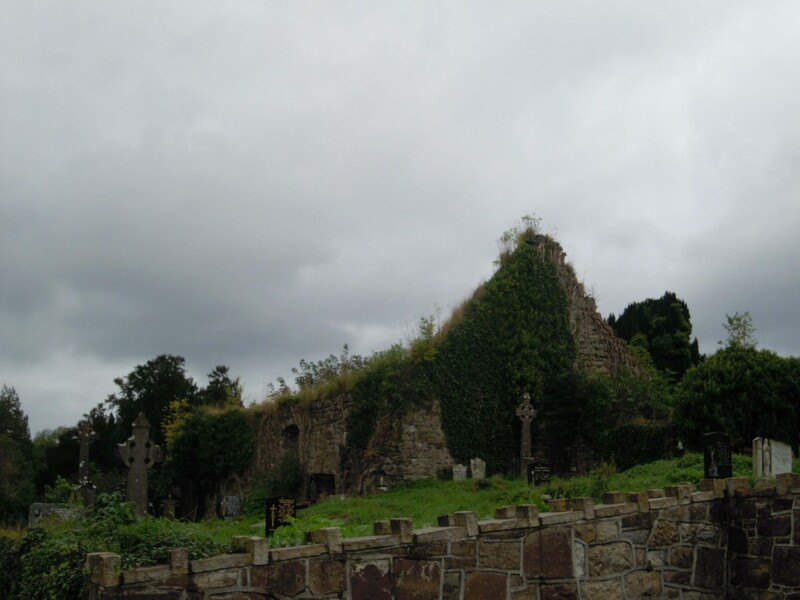 The ruins of Kilronan church and the final resting place of Turlough O Carolan (in the foreground) in the side chapel of the MacDermott Roe family. In the background is the tomb of the MacDermott Roe family of Alderford House, Kilronan, with whom O Carolan’s father found employment. The MacDermott Roe family served as initial patrons of the young O Carolan, with Mrs. Mary Fitzgerald MacDermott Roe placing him under the tutelage of a reputable harper at a young age. Although blind from his youth as a result of smallpox, O Carolan thereafter spent much of his life travelling about Ireland playing and composing music, deriving patronage from various families of the landed gentry such as the O Conors of Belanagare. 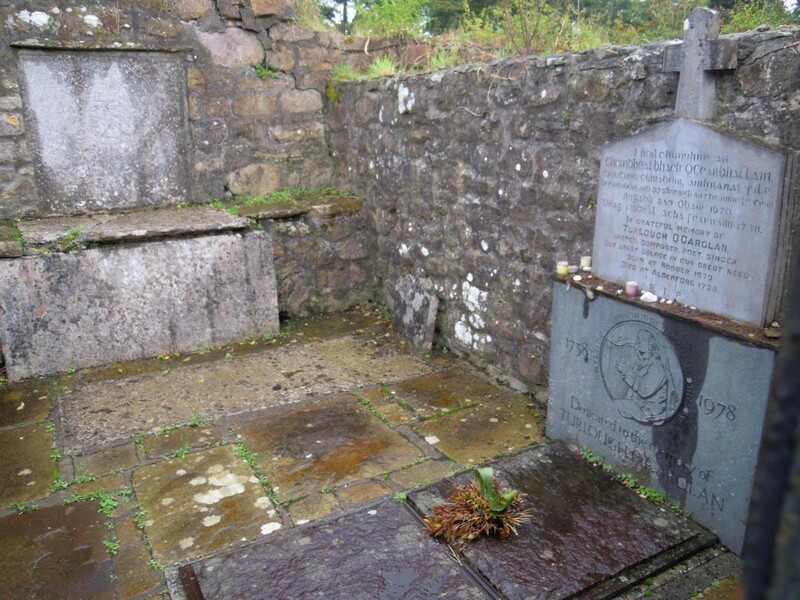 At the age of fifty years he married, had a family and settled in County Leitrim but, after the death of his wife and nearing the end of his own life, he returned to his early patron and friend Mary MacDermott Roe and he died at Alderford House in 1738. Following a wake of four days, members of the MacDermott Roe family served among his pall bearers and approximately sixty members of the clergy were reputed to have attended his burial at Kilronan. 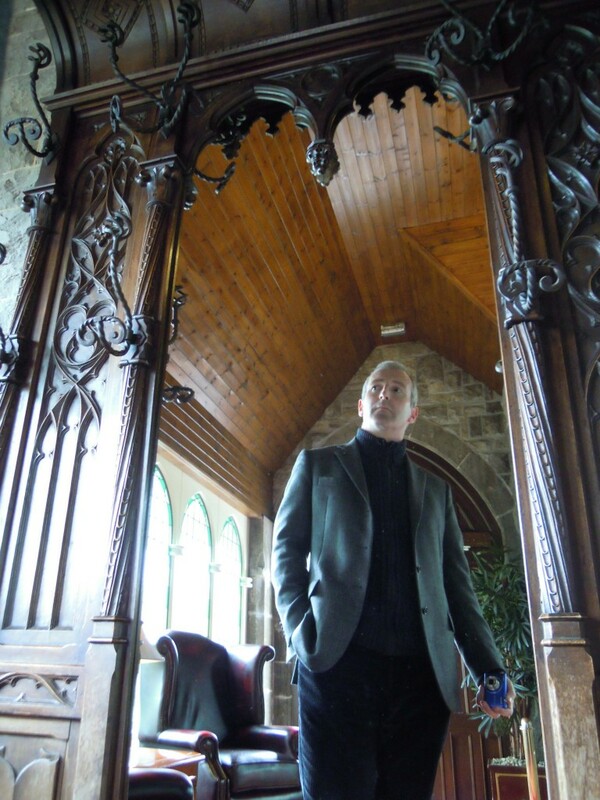 The developers who purchased Kilronan Castle and restored the ruin did a wonderful job, saving for the region an architectural treasure that, had it been left for much longer, would have fallen beyond repair. Alison and I are proof of the fact that buildings like this are an invaluable addition to the economic life of the region. 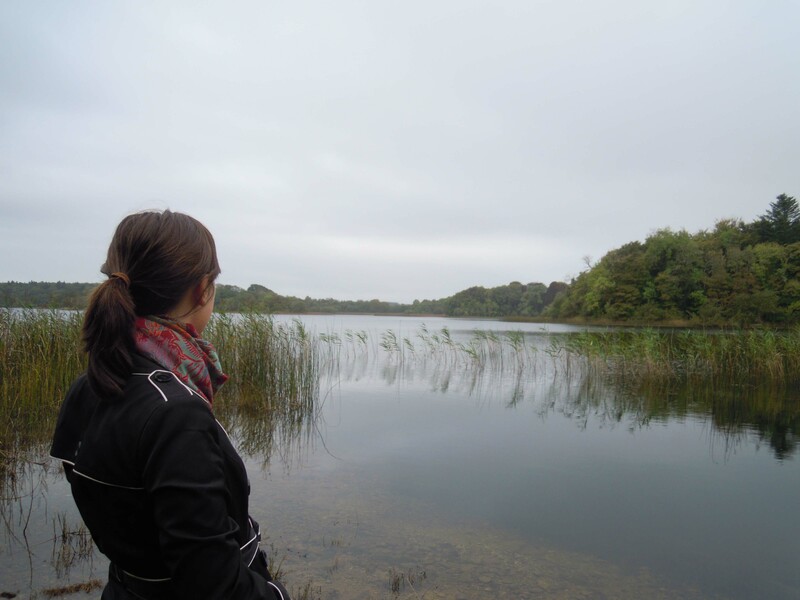 It was Kilronan that brought us to North Roscommon and we were only two of the many tourists staying there, all spending locally and supporting the local economy. 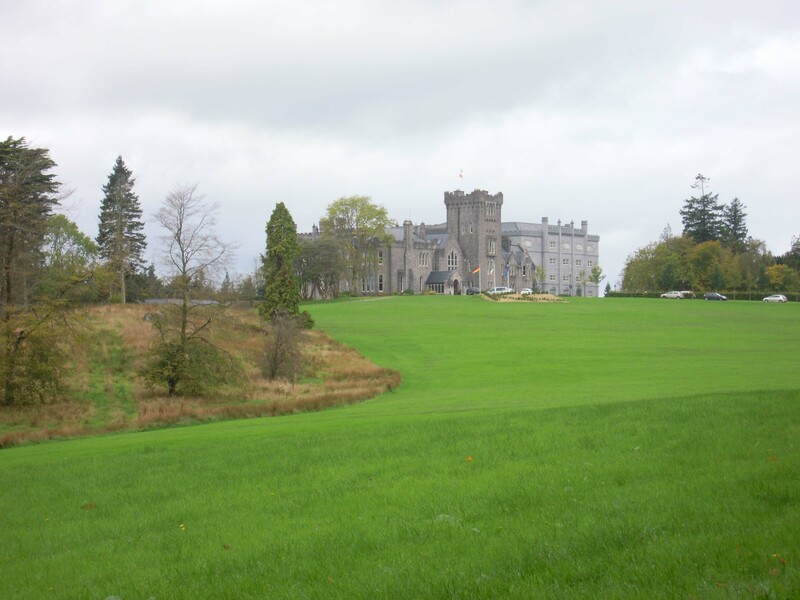 We both agreed as we drove away from Kilronan Castle that it wouldn’t be our last time and that we would be back to spend more time in the castle itself and the surrounding region.